I appreciate the opportunity given to me by the principals and media coordinators of these schools in allowing me to come and share "My Days with Nell" with their students. Sharing my story with elementary age students has been an unexpected joy. The schools I have visited have been so welcoming and the students so respectful and polite...well..it's just been a blessing. I'm grateful beyond words. Grand descriptions of days gone by and a heartwarming tale of friendship enthralled students at Marion Elementary during a recent visit from McDowell County author Victoria “Vicki” S. Blake. 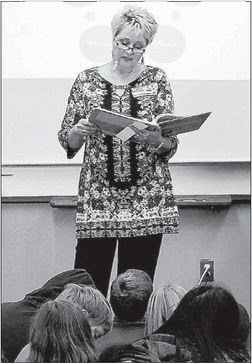 Blake spoke to students about her first published book, “My Days with Nell” and helped kids better understand the writing process. 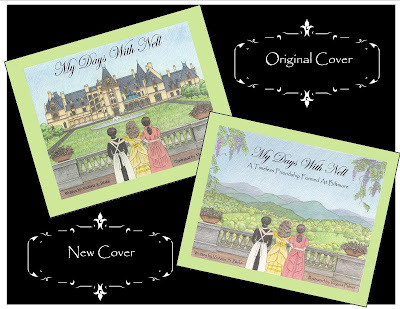 “My Days with Nell” takes place in the early 1900s on the Biltmore Estate in Asheville. Blake wrote the book because of her love of writing and the grand house that tourists from around the world visit every year. After talking to students about the plot, Blake explained that writing a book was no simple task. After going through the other steps, like drafting, revising, and helping local artist Virginia Palmer come up with image ideas for the book, Blake then asked kids a few questions to get their minds going. “Could I have written that Lilly woke up? She went downstairs? She ate breakfast?” asked Blake to the group of fourth-graders present during one of her many presentations. “You could have, but it would have been boring,” said one of the students. After that answer, Blake explained that writing isn’t so much about listing out events, but asking who, what, when, where and why and writing something that people can relate and sink in to. Blake ended her presentation to students by encouraging them to try new things and to leave a legacy that they would be proud of. Author Day at Marion Elementary! What a great day at Marion Elementary School; I had the best time! Today I had the pleasure of presenting my book, "My Days with Nell" with students in grades 2-6. They were extremely respectful and well behaved. The students listened intently and asked pertinent questions at appropriate times. I enjoyed sharing some of the Christmas traditions of the Vanderbilts as well as the North Carolina Common Core Writing Process I used in writing my book. I am especially grateful to Mrs. Mace, Media Coordinator, for her technical expertise and staying with me and encouraging me all day. She is just precious and so warm and welcoming... felt like I had known her for years. :) I would also like to thank, Tammy Washburn, fourth grade teacher, who was kind enough to invite me to share my love for the Biltmore House with others. I loved visiting with some sweet friends, Mrs. Diane Ray, Mrs. Jody Johnson, Mrs. Sherry Truesdell and Miss Chrissy Parker. I've known each of these ladies for years... it was so nice to see them and "catch up." I know the fourth graders will be going to the"House" on the 17th; I hope they find all 56 beautifully decorated trees during their visit and I hope our time this morning will excite them about their upcoming trip. 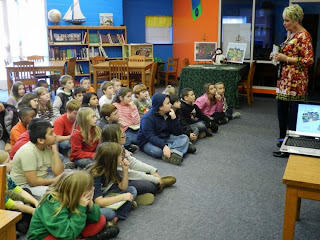 The "Author Day' I spend with elementary students is so special to me and these kids were awesome! My Days with Nell is now available on Amazon.com! Finally.... It's Here! An Early Christmas Present!! 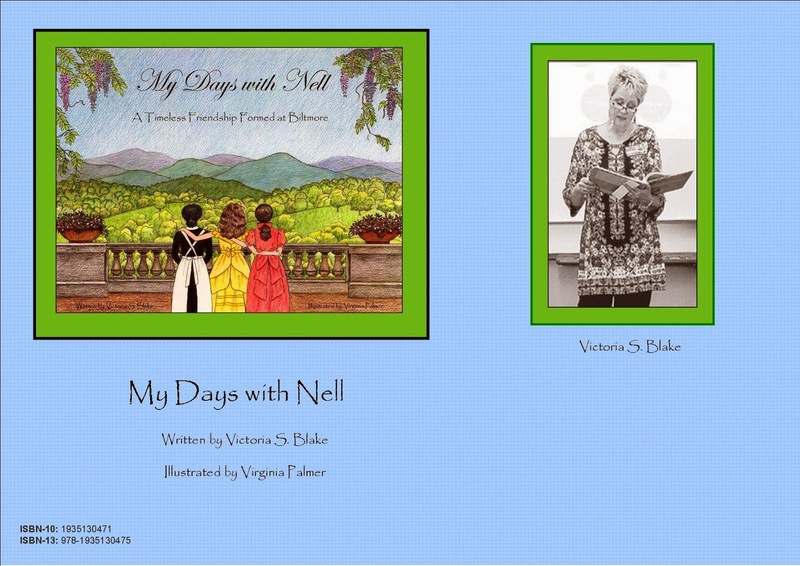 I was so pleased to receive a phone call this morning from Grateful Steps Foundation, LLC owner, Micki Cabaniss Eutsler, announcing the arrival of the second printing of our book, "My Days with Nell." I jumped in my car and could not wait to see the new cover in person. It's one thing to see it in the original form on canvas from talented artist, Virginia Palmer, then another to see it on a computer screen in a pdf awaiting upload to the printing company, but to see it on the hardcover book... well that is a little different...it is almost surreal. The new cover is very similar to the original cover in color and theme; the only difference is the view. Instead of looking at the iconic image of the beautiful Biltmore House, Nell, Lilly and Ellen Jorith are standing on the loggia looking out at the vast property owned by George Vanderbilt with Mt. Pisgah in the distance. I love it ! I hope you all will love it as well. I dropped a few copies by William and Grace Children's Boutique and Once Upon a Time Children's Toy Store in Asheville, and a few more copies at MACA here in Marion. These kind folks have been so supportive of the book and I appreciate their willingness to carry it in their stores. Also, I believe copies will be delivered this week to Malaprops Bookstore, Spellbound and last but certainly not least the Biltmore Estate...(still takes my breath away) Of course, Grateful Steps Bookstore has a few copies for sale as well. ;) I am so grateful to each and every person that purchased my book... friends and family have been so kind with their sweet comments. I have attached a picture with both the original cover and our new one for you to compare. I adore them both!